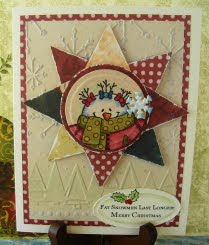 Vada's Blog Stamp Inks and Paper : Fat Snowmen Last Longer. Thought this would work well with our CG# 81 Gingersnap “Snow People” Challenge. While at convention this fall, I saw these “Country Stars” done as ornaments and decorations for packages and gift bags. So easy to do I just had to try it too. My little snow girl is from Darcie’s, and I don’t know if she is still available as she is from the early 1990’s. The two embossing folders are from Sizzix. The “Fat Snowmen” is a computer font. She was colored with Copic Markers and sprayed with Glimmer Mist. 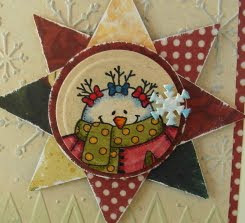 Have a great day, stay warm, sounds like we may get a few inches this week-end. Who’s up for a snowman in the front yard? Vada, your little snow girl is too cute! Beautiful detail in your card as always! Love how you framed the sentiment and added the holly leaves! Love this! Adorable layout, love that quote.